NASA leader Raila Odinga has disclosed that a committee charged with the responsibility to prepare his swearing-in will release elaborate details of the anticipated event tomorrow. 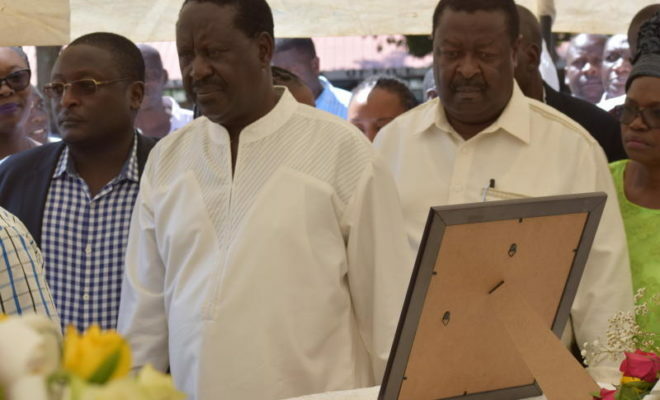 Addressing hundreds of mourners on Saturday at Mahanga village in Vihiga during a funeral service of the 16 people who perished in grisly road accident at Kamukuywa Bridge along the Webuye –Kitale road last week, Raila said the arrangements would go on as earlier planned. The former premier took issue with President Uhuru Kenyatta saying he appeared reluctant to embrace dialogue even after his (Raila’s) event was postponed to create room for deliberations. “Uhuru thinks Kenyans have given up, he is wrong because we shall go ahead with our plans, and the committee will give us more details of what to expect,” Raila said. Raila said the opposition will not relent in push for electoral reforms and justice in the country. He reiterated that NASA does not recognize Uhuru as duly elected President since the October 26 presidential repeat elections were not held in accordance with directives given by the Supreme Court. According to him, he won the October 8 elections fair and square and has the right to take oath of office. “We beat them in the elections and any one doubting that should open the server and see what the figures tally says,” he argued. “Being the duly elected president, I will not hesitate to carry the bible on the day to be announced to Kenyans tomorrow”. NASA co-principal Musalia Mudavadi hailed the sentiments saying the opposition will be announcing a new date for the launch of the people’s assemblies and the swearing-in ceremony for Raila. Raila has declared before that he is prepared to pay the ultimate price by carrying the bible if that will guarantee Kenyans electoral reforms and justice for posterity. MPs present including Alfred Agoi (Sabatia) challenged Raila to make his position well known to his supporters and not to relent in his quest to become Kenya’s President. He also wanted thorough investigations conducted to establish the cause of the tragic accident that claimed 19 people in total. On road safety, Raila took issue with the National Transport and Safety Authority (NTSA) blaming it for the runaway road accidents across the country. He said proper police reforms must be undertaken as part of deliberate measures to address increasing cases of road carnage. He also accused national government of laxity in implementing and enforcing road safety regulations to help curb accidents. Raila lashed at Acting Interior Cabinet Secretary Fred Matiang’i and his Transport counterpart James Macharia for their alleged failure to address challenges facing road users in the country. Lugari MP Ayub Savula who addressed mourners in Khwisero said legislators would join forces to reject Matiang’i name if presented to them by President Uhuru in parliament. “We shall not allow him to continue ruining the lives of our children by ensuring they fail to pass exams, we shall reject his name if presented to us in the House,” he said.